Dawes is an American folk rock band from Los Angeles, California. Dawes is composed of brothers Taylor (guitars and vocals) and Griffin Goldsmith (drums), along with Wylie Gelber (bass) and Lee Pardini (keyboards). Dawes was formed from the band Simon Dawes after the departure of co-songwriter Blake Mills, subsequently abandoning a post-punk sound in favor of folk rock. Dawes has been described as having a Laurel Canyon sound derived from artists such as Crosby, Stills, and Nash, Joni Mitchell and Neil Young. At the invitation of producer Jonathan Wilson, the band joined a local informal jam session that included Conor Oberst, The Black Crowes's Chris Robinson, and Benmont Tench. The band recorded their debut album, North Hills, in Laurel Canyon in a live setting to analog tape, resulting in a sound that Rolling Stone magazine called "authentically vintage". Wilco multi-instrumentalist Pat Sansone is also credited with appearing on the release. The band made their television debut on The Late Late Show with Craig Ferguson on April 14, 2010. Dawes released their second album, Nothing Is Wrong, on June 7, 2011 and toured the US co-headlining with Blitzen Trapper. Original keyboardist Tay Strathairn did not appear on Nothing Is Wrong due to other commitments and was temporarily replaced by Alex Casnoff. Strathairn returned to the band in late 2010. Dawes played alongside Jackson Browne at the Occupy Wall Street event in Zuccotti Park, on December 1, 2011. The band also appeared as themselves on the February 7, 2012 episode of the NBC television series Parenthood. In February 2013, the band released the single "From a Window Seat" from the 2013 album Stories Don't End on Red General Catalog and their own Hub Records. The song "Just Beneath the Surface" from Stories Don't End was featured in the episode "Independent Movie" of the animated series American Dad! On April 22, 2015, Dawes performed on The Late Show with David Letterman, paying tribute to Warren Zevon with their cover of "Desparados Under the Eaves". They also performed the song "Things Happen" on the show. Duane Betts joined the band as a member of their touring ensemble in June 2015, performing as an auxiliary guitarist. Taylor and Duane alternated playing lead guitar on songs. The band's fourth album, All Your Favorite Bands, was released on June 2, 2015. Three months later, the departure of keyboardist Tay Strathairn was announced in a Facebook post. Lee Pardini began playing keyboards on the band's winter 2015/2016 tour and became a permanent member of the band in July 2016. Betts also left the touring ensemble, and was replaced by guitarist Trevor Menear. Dawes' fifth album, We're All Gonna Die was released on September 16, 2016, on HUB Records. The record marked a distinct change of style, building on the band's previous Laurel Canyon folk rock sound with a sonic twist, adding in more synthesized keyboard sounds, heavier bass, and an overall different sound for the group (while still staying true to their roots). We're All Gonna Die was produced by former founding member of Simon Dawes, Blake Mills. In November 2016, they announced their "An Evening with Dawes" tour, which began in January 2017. The "Evening With" tour is distinct from past tours because, instead of having an opening act, they perform 2-3 hour shows with a small intermission. Passwords, Dawes' sixth studio album, released on June 22, 2018. The album saw the return of producer Jonathan Wilson, and is "for and about the modern age: the relationships that fill it, the politics that divide it, and the small victories and big losses that give it shape." The band launched a marketing campaign for the album that encouraged fans to search for "passwords" posted throughout the Internet. Once a password was found, it could be entered onto a page of the band's official website where each part of the password represented a musical note. When entered correctly, these musical notes played various musical refrains from Dawes songs and unlocked exclusive content, including the singles "Never Gonna Say Goodbye" and "Telescope," as well as a Spotify playlist curated by Griffin Goldsmith. "When the Tequila Runs Out"
^ Fitzpatrick, Andy. "Dawes Coming to Kalamazoo State Theatre". Battle Creek Enquirer. Gannett Satellite Information Network. Archived from the original on July 2017. ^ Josh Eells (2009-11-11). "Breaking: Dawes". Rolling Stone. Retrieved 2009-12-11. ^ a b Pemberton Roach. "Dawes". allmusic.com. Retrieved 2009-12-11. ^ Benjy Eisen (2009-11-23). "Dawes Use the MacGyver Method for Equipment Repairs". spinner.com. Retrieved 2009-12-28. ^ JENNY ELISCU (2009-10-13). "North Hills – Dawes". Rolling stone. Retrieved 2009-12-11. ^ Aly Comingore (2009-12-17). "Dawes Plays Muddy Waters:L.A. Folk Rockers Channel Vintage California". Santa Barbara Independent. Retrieved 2009-12-28. ^ Shannon Cosgrove (19 February 2011). "Q & A with indie rock band Dawes". University of California, Los Angeles. Archived from the original on 24 September 2012. Retrieved 23 February 2011. ^ "New Song: "From A Window Seat"". Official Dawes band homepage. 2013-02-08. Retrieved 2013-02-10. ^ "Dawes Face Fears on "From a Window Seat" – Song Premiere". Rolling Stone. 2013-02-07. Retrieved 2013-02-10. ^ "Duane Betts Is Now A Member of Dawes Touring Band". Jam Bands. 2015-05-09. Retrieved 2016-01-05. ^ "Dawes in Delaware". Relix. 2015-12-21. Retrieved 2016-03-27. ^ Sutton, Larson (2016-12-16). "Dawes: The Unexpected and the Inevitable". Relix. Retrieved 2018-06-08. ^ "Dawes Announce New 'We're All Gonna Die' Album, Release 'When the Tequila Runs Out' Single". diffuser.fm. 2016-08-17. Retrieved 2016-08-17. ^ Vallejo-Lopez, Abdiel (April 27, 2018). "Dawes Announce Their Sixth Album, Passwords, Due out in June". Paste. Retrieved May 21, 2018. ^ Prabhu, Suraj (2018-05-15). "Dawes debut music video for 'Living in the Future,' first single from upcoming 'Passwords'". Meaww.com. Retrieved 2018-06-08. ^ Johnson, Ellen (2018-06-07). "Exclusive: Dawes Launch Passwords Site, Share New Single "Never Gonna Say Goodbye"". Paste Magazine. Retrieved 2018-06-08. ^ "Dawes Chart History (Billboard 200)". Billboard. ^ "Dawes Chart History (Heatseeker Albums)". Billboard. ^ "Dawes Chart History (Top Rock Albums)". Billboard. ^ "Dawes Chart History (Folk Albums)". Billboard. ^ "Upcoming Releases". Hits Daily Double. HITS Digital Ventures. Archived from the original on May 15, 2015. ^ "Dawes Chart History: Triple A". Billboard. Retrieved October 30, 2018. 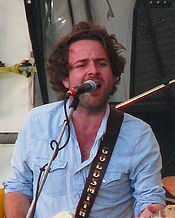 Wikimedia Commons has media related to Dawes (band).